Happy Thursday! Can’t believe the week is already almost over. I feel like time is flying by so fast and it’s kind of scary. I’m super excited to be sharing this slouchy sweater with you today because it is so cozy and I love that it has different shades of beige. What’s better than just a beige sweater, in my opinion? A beige sweater with more than one beige. Ha! I wore this look out to dinner in Vermont a couple weekends back and felt so comfortable and cozy in it. For me, I can wear a slouchy sweater all year-round. I’m not usually cold (on the contrary, I’m always hot), but for some reason I’m never bothered when wearing a comfy sweater like this one. I’m also crushing on this sweater! I paired it with some gold accessories, including this really pretty gold necklace that I have been wearing on repeat lately. Oh, and good news! I found my favorite sandals fully stocked here. PS. My favorite cardigan is currently marked down 25%! It’s so soft and cozy and I really want to get the sapphire color now. Ah! This is such a pretty sweater!! Such a perfect casual look! I love that sweater on you! So cute and casual! Absolutely love the shape of this sweater! 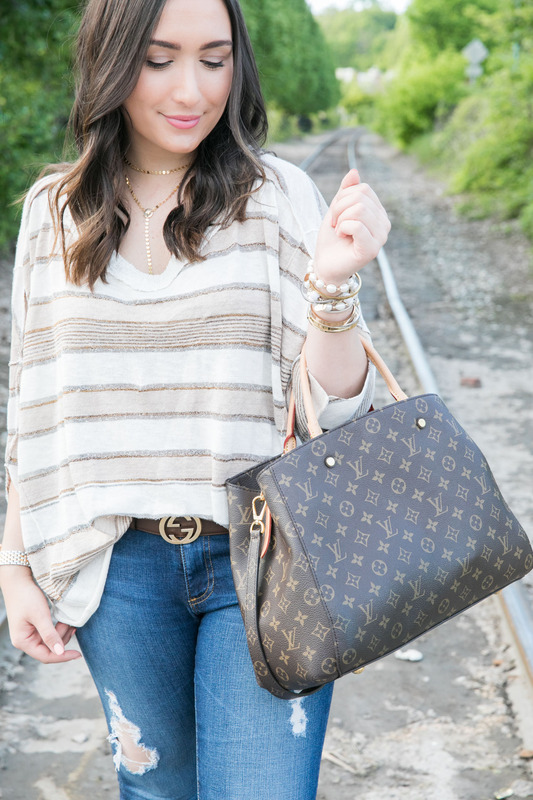 Slouchy sweaters are a favorite of mine year round! The perfect cozy sweater for every day wear! 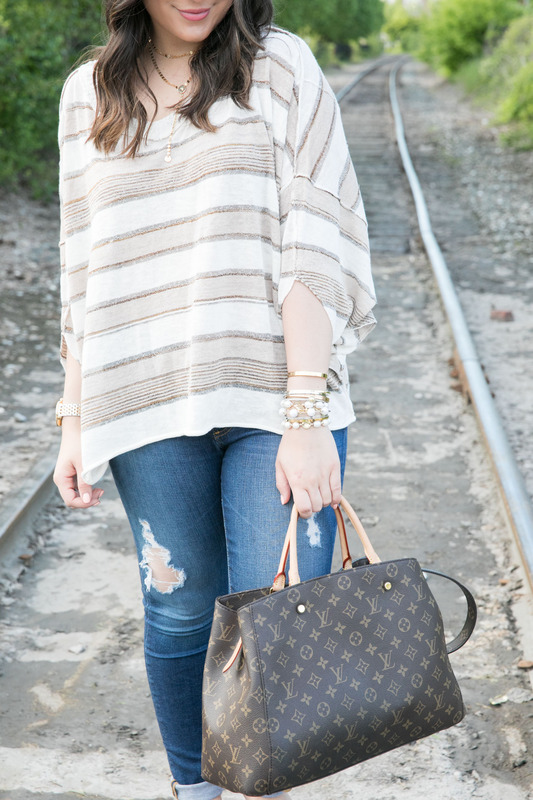 I love this comfy slouchy sweater! It is the perfect transition piece! 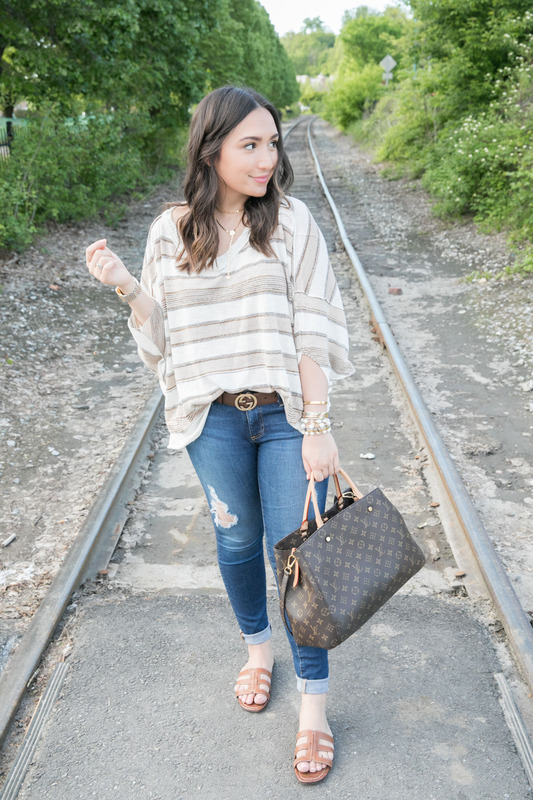 I am such a fan of slouchy sweaters for the summertime. They’re so comfy and perfect for throwing on when it’s a windy day at the beach, or when it’s a chillier summer evening, or even just to go see a movie (I always freeze in theaters haha). This one is so cute! Adorable sweater! Love that cardigan you shared too. Love your sweater!!! So cute !! And the right kind of slouchy! What a great look! I love the slide sandals too, they remind me of the Hermes style!